Bocce Courts are Heated and Covered. No reason Not to Play in any weather! Bring your Friends! Bocce Courts are Enclosed and Heated! WOW - that's a Bocce Record! 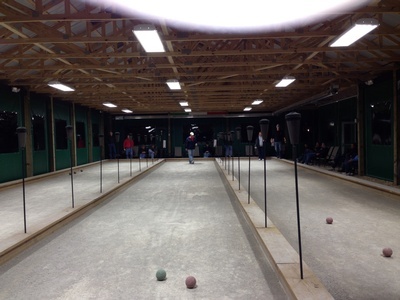 Call 636-441-0994 or come by 5286 Hwy N and sign up your team for future bocce ball leagues. 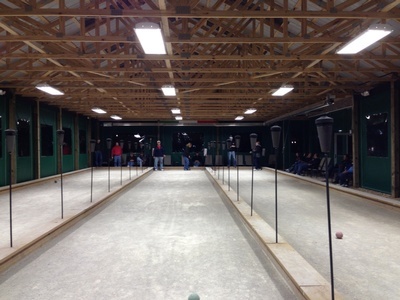 [Bocce (singular), Bocci (plural)] — four for each team. the goal of placing it as close to the Pallino as possible. of scoring periods called Giri (plural) or Giro (singular). The team that reaches eleven points first wins the Round. same team that is closer to the Pallino than the closest Bocce of the opposing team. opposing team, four points will be scored for the winning team and none for the opposing team. It's a WASH if two opponents balls are of equal distance to the pallino. If a throw is illegal, (i.e., hits backboards and bounces into play) and ball hits the Pallino then all Bocci are returned to their previous positions, and the illegal Bocce is removed from play. 2 consecutive games (1 player always rotates off). If only 2 players are available, those 2 players can play 3 games but must forfeit 3 games.